First 35 buyers receive a special set of gifts! The RAANDESK GALLERY OF ART takes the idea of giving art as a gift to a new level with the exclusive ART2Gift ™-services. Last November, Ten Miles Square and the Pink Line Project presented the photography exhibit "Fixation" at Fight Club, which drew over 700 people on opening night, not to mention coverage from the Washington Post both before and after the show. 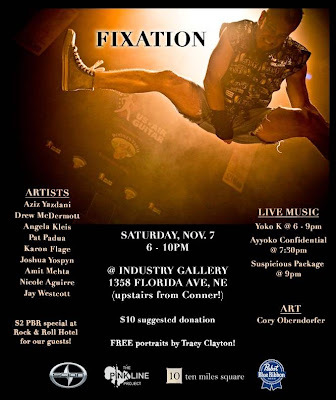 This year, "Fixation" moves to H Street, NE! And features awesome photographers who document DC's subcultures. Along with great live music and lots of the usual beverage. Skater's welcome! 6-9 PM Music by Yoko K! Portrait photographs: Have your portrait taken by photographer Tracy Clayton in front of a specially commissioned backdrop created by fab artist Cory Oberndorfer. Awesome "Fixation" photographers: Aziz Yazdani, Drew McDermott, Angela Kleis, Pat Padua, Karon Flage, Joshua Yospyn, Amit Mehta, Nicole Aguirre, and Jay Westcott. *An opening of Koen Vanmechelen's "Cosmopolitan Chicken Project (DC)" at one of DC's top contemporary art galleries Conner Contemporary. *G Fine Art's new space on the same block. *A first look at the home of the new Industry Gallery, a contemporary design exhibition space. Phil Nesmith, Contained, 2009. Varnished dryplate photogram on black glass. 18 x 13 in. Oliver Vernon, Gypsy, 2009. Gouache, watercolor, ink and graphite on paper. 23 1/2 X 17 3/4 in. 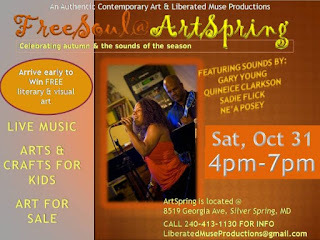 Authentic Contemporary Art and Liberated Muse Productions present an afternoon of music, art and warm energy. Set in the new ArtSpring Pyramid Atlantic Community Arts Store in Silver Spring, MD, this afternoon features some DC's hottest emerging artists. A book sale and signing of Liberated Muse, Vol 1: How I Freed My Soul Anthology, featuring local visual and literary artists, will also be featured. Featuring live performances by Ne'a Posey, Quineice Clarkson, Gary Young & Sadie Flick, the musical sounds will entertain while you enjoy the artwork and activities. Bring the family out for arts, crafts & more! Music for grown-folks, fun for the family! Music for grown-folks, fun for the family! To RSVP, visit the FaceBook page here. The Art Festival is looking for activist art workshop, roundtable or other interactive ideas around the idea of using art for social transformation. These are to be part of programming for the first ever Amnesty International Human Rights Art Festival. Suggested Donation: $20 at Door (Proceeds Benefit Fotoweek DC). The Call to Artists is open to all artists residing in Maryland, Virginia, and Washington, DC over the age of 18 for original artwork only. All work must be ready for sale and to be presented in a professional manner to the public at the time of delivery. BlackRock Center for the Arts gallery is 1500 square feet of exquisite gallery space. With its high white walls and beautiful windows strategically placed it allows in just the right amount of natural light. The eclectic group of artists exhibited over the past seven years have been reviewed by Claudia Rousseau, Lenny Campello, and other art critics in the area. The Torpedo Factory hosts Art Outlet's Ofrenda 2009, a spectacular Halloween celebration in the tradition of the Mexican Dia de los Muertos (Day of the Dead). This is Art Outlet's third annual Ofrenda. More info about Art Outlet at http://www.artoutlet.org/ . In Dark Rococo, Ruth Bolduan finds a correspondence between 18th century painting and current aesthetic ideas, particularly the renewal of interest in the concept of Beauty. Her works are linked to history, to the feminine, and to an unbroken lineage of artistic creation. These paintings reveal a sense of global and political malaise beneath their light-hearted façade, just as the splendid flowering of the Rococo contained the seeds of its own collapse. The paintings in Dark Rococo were created shortly before, during, and after the economic collapse of September 2008. The Ripple Effect, featuring the works of former students of Bolduan, is a manifestation of the subtle interplay between teacher and student, fragments and moments of perception, occasional anger, insight, and awe, which characterizes the relationship between older and younger artists throughout history. The exhibition presents the work of four former students: Matthew Fisher, Maya Goldweber, Theresa Pfarr, and Jonathan Weston. Art Whino and WHALER’s Creation present “Old Skoolin’ for the Children,” a four city concert and art show tour that brings together the best visual and musical artists to benefit programs that support foster care and adoption programs. Legendary founder of the hip-hop movement Darryl “DMC” McDaniels of Run-DMC will perform old skool, throw back shows true to the roots of the genre. Over 100 of Art Whino’s internationally renowned talents from the underground street art world will be showcasing their old school, 80's themed creations. Show Run Date: 1 Day so don't Miss it! 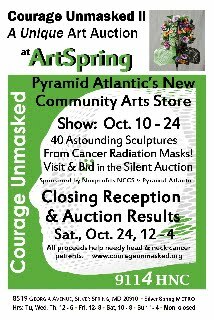 Cost: $95 | Contact Smith Farm Center for Healing and the Arts to register. This is a workshop designed to demystify the business of art and prepare artists to succeed in the highly competitive art market. Artists will receive insight on gaining exposure through alternative art spaces, preparing a professional portfolio and what every artist should know before signing a contract. Sandi Neiman Lovitz graduated from Penn State University in '69 with a Bachelors degree in art education. She attended summer art classes at Carnegie Tech and was a juried member in the Pittsburgh Watercolor Society before moving to Philadelphia to continue an art career. Lovitz's passion for art led her to form various businesses that involved the creative process. She started Plastic Fantastics with a friend, designing and manufacturing Plexiglas functional art pieces. As a sign writer, she did free style hand lettering on windows, tractor trailers, paper and wood for 10 years. She created murals in private and commercial settings and created a line of hand-painted furniture that was represented by area galleries. During this time, Lovitz continued to exhibit her paintings in gallery exhibitions. She was President of the Tri-State Pennsylvania Artists Equity, and continues to be an active board member. Lovitz is an active member of ART SISTERS, a group of professional women visual artists who empower each other and the community through art. She is on the faculty at Main Line Art Center, an Art Center recognized for the quality of its community-based exhibitions, instructional programs and outreach. The artist can be reached at her studio in Manyunk, Pennsylvania. 123 & 124 Leverington Ave. Opening Reception: Saturday November 21, 7:30 p.m.
One of my favorite artists is opening here. When Commodore Perry’s black ships anchored at Edo Bay in 1853, Japan’s era of seclusion came to an abrupt end. Almost overnight, the island nation was inundated with western ideas, goods, and technology. Railway and postal services were established and Western-style factories were built. More people moved to the cities and, with increasing leisure time and disposable income, Japan’s modern society began to take shape. A key architect of this emerging modern society, Eiichi Shibusawa recognized that strong international relations were another essential component to the country’s modernization. A dynamic force in the industrial world, he helped to establish hundreds of enterprises, social welfare and education organizations. When the focus of his nation building efforts shifted from economic modernization to Japan’s place in the international community, he devoted his extraordinary energies to building positive relationships with nations he saw as important actors on the world stage. In 1909, he led the first delegation of Japanese businessmen to the United States, where they were warmly welcomed by leaders in every field. In celebration of the centennial anniversary of that historic exchange, over 50 color woodblock reprints from the Shibusawa Memorial Foundation will be on display, revealing the foundations of the nation’s modern infrastructure, industrialization, and urbanization. Historic images and articles highlighting the Japanese Commercial Commission’s trip to the United States will accompany these vibrant works of art in capturing the dynamic encounter of cultures that took place during the Meiji and Taisho eras of Japan. Visit Transformer through Saturday, October 31 for a last look at the compelling work of Beijing-based artists CHEN Shaoxiong, DAI Guangyu, and Paula TSAI in Transformer's Ink Storm exhibition. Ink Storm highlights how the participating artists incorporate traditional uses of ink into their work, and how each individual exploration contributes to contemporary art discourse. Ink Storm is the result of a creative collaboration between Transformer, Shigeko Bork mu projects, and artist/guest curator Jennifer Wen Ma. Click here to see what Jessica Dawson of The Washington Post has to say about Transformer's Ink Storm and its sister exhibition Brain Storm at The Phillips Collection. Ink Storm Exhibition Hours: Wed - Sat, 1-7pm, and by appointment. Flamenco music infuses these new works. 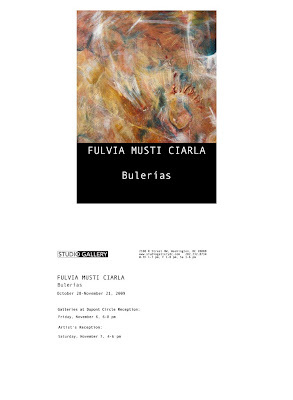 Each painting in its unique way expresses Fulvia Musti Ciarla's personal response to this wonderful music. 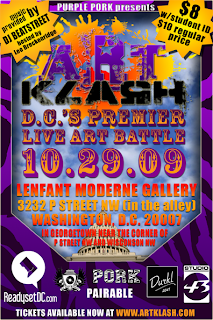 Art Klash is a social gathering and live art battle celebrating creative minds in the nation?s capital. The battle places four of the Washington D.C. area's best painters in front of a live audience with nothing more than a blank canvas and 90 minutes to construct a painting based on a randomly selected theme. Winners will be selected by judges and live audience. X.O., Studio 43 recording artist, and Juanita "Busy Bee" Britton, owner of the Anacostia Art Gallery, are guest judges for the battle. Tickets are $8.00 in advance for Students and $10.00 in advance Regular Price. Tickets will be on sale at the door for $10.00. Doors Open at 8:00pm. Competition starts at 8:30pm. 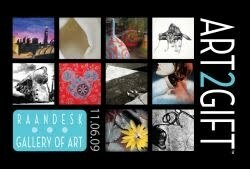 Visit www.ArtKlash.com for more info and pictures from the past events. Visit Transformer's website to download and invite, and for recent updates on participating Auction Artists, our Host Committee, and Sponsors. New this year - A downloadable pdf of the artworks to be included in this year's Auction is now available! Visit www.transformergallery.org . 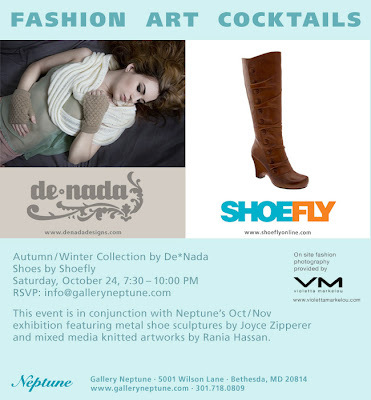 Gallery Neptune hosts an exciting evening of informal modeling featuring the newest collection from DC’s De*Nada with shoes provided by ShoeFly. The event will be photographed by fashion photographer Violetta Markelou. FASHION ART COCKTAILS will take place during Neptune’s fall exhibition featuring established Virginia artist Joyce Zipperer’s latest collection of high heeled shoe sculptures in metal along with the knitted mixed media work of Washington, DC artist Rania Hassan, a recent James Renwick Alliance Award of Distinction recipient. De*Nada is an emerging accessories line, specializing in handmade knits for women and men. De*Nada is currently sold at select retailers throughout the U.S. and around the world. De*Nada is the vision of its founder, Virginia Blanca Arrisueño, who in spring 2005 sought to blend contemporary styles with ethnic elements to offer stylish yet high-quality merchandise. Inspired by the culture and the traditions of her Peruvian heritage, Arrisueño continually works alongside skilled artisans in Perú to create De*Nada's growing collection. She put her business savvy and artistic aptitude to work and established De*Nada (which commonly means "you're welcome," in Spanish), initially selling handbags and t-shirts. Over the years, the De*Nada collection has grown to include knit accessories such as scarves, gloves and hats. The idea for ShoeFly was started out of a need for unique yet wearable shoes at prices that were not over the top. In their stores, you will find a large selection of shoes from a wide variety of companies including Pink Studio Footwear, Seychelles, Campers, Jeffrey Campbell, J-41, Blowfish, Naughty Monkey, and Gola. Men need not feel slighted, as they also carry men’s footwear by Camper, PF Flyers, John Fluevog, Gola, Earth, Pony, and more. Men and Women alike can also find Vegan styles from Matt & Nat and Earth. ShoeFly has a reputation for great affordable accessories, handbags, and more. ShoeFly locations include 2727 Wilson Blvd, Arlington, VA, 1520 U St, NW, Washington, DC, 4731 Elm St., Bethesda, MD and online at www.shoeflyonline.com. Violetta Markelou attended the University of Maryland in Baltimore majoring in Photography and Art History. While completing her BFA, Violetta became a makeup artist for the Estee Lauder Company. She continued working in the makeup industry for the next five years, freelancing with local TV studios and photographers. Violetta is self-taught in the areas of beauty and makeup for photography but has received formal training for theatrical and special effects makeup from Montgomery College, Maryland and the University of Maryland. With ample experience in the makeup industry under her belt, Violetta began assisting several commercial photographers in the Maryland and DC area to hone her craft in photography. After a few years Violetta decided to open her own studio and create an enticing brand of images under the name VM, on the web at www.violettamarkelou.com. Adamson Gallery presents an exhibition of photographs by Edward Burtynsky. "Oil" examines the resource from all sides, depicting the mechanics of its extraction and refinement, the details of its consumption and the effects; physical, political, and economic, of its influence. The large-scale photographs are reminiscent of the tradition of landscape painting, yet the landscapes they depict force the viewer to rethink the connection between nature and industry. Burtynsky has traveled the world to document the influence of oil, taking photographs of oil fields in Azerbaijan, Canada, California, highways in Texas, and industrial parks in Shanghai, among other places. Like the landscape painter before him, the artist shoots from a distance, letting the scale and sprawl of his subjects overwhelm the piece and its viewer. Like paintings in the sublime tradition, Burtynsky's photographs inspire awe as well as apprehension-the images are very beautiful, but they document a frightening reality. Highway #2 is an aerial shot of a highway loop in Los Angeles - the road twists and turns, making complicated, abstracted swirls. The patterns are mesmerizing to the eye and remind the viewer of the power of technological and industrial innovation. However, in the context of this series, and when placed alongside Burtynsky's other photographs, this piece acts as a powerful reminder of the continuum of production. These dual messages are a potent commentary on contemporary life. The artist writes, "These images are meant as metaphors to the dilemma of our modern existence; they search for a dialogue between attraction and repulsion, seduction and fear. We are drawn by desire - a chance at good living, yet we are consciously or unconsciously aware that the world is suffering for our success. Our dependence on nature to provide the materials for our consumption and our concern for the health of our planet sets us into an uneasy contradiction. For me, these images function as reflecting pools of our times." This project is part of a larger inquiry into the interactions between nature and industry. Burtynsky has also completed series of photographs of shipyards, quarries, and urban mines which have been exhibited internationally. Images from the series are also on display at the Corcoran Gallery of Art and have been collected in a new artist book from Steidl. Edward Burtynsky's work has been collected by the National Gallery of Art, the Brooklyn Museum of Art and the Solomon R. Guggenheim Museum, among many other institutional and corporate collectors. He lives and works in Toronto, Canada. Funding was provided by the Center for Consciousness and Transformation, George Mason University, with support from Hamiltonian Artists, Smith Farm Center for Healing and the Arts, and the School of Art, George Mason University. Image: Three Seconds with the Masters - Swing, 2009, archival prints, 44 x 74 inches, edition of six. In his premiere exhibit at Addison/Ripley Fine Art, photographer James Osher presents an exhibition that examines subject matter which is derived from historic paintings in several museums, including, most recently the National Gallery of Art in Washington, DC. As the artist states, "My work explores the transitory aesthetics of contemporary art viewing." By basing the work on the paintings of Masters and Old Masters, the artist is able to examine culturally assumed "value" as it pertains to "priceless" objects. Osher's work allows viewers to experience these masterpieces in entirely new ways, forming fresh conceptual relationships with historically relevant works of art. Cultural Development Corporation (CuDC) is requesting proposals for Flashpoint Gallery's September 2010 - August 2011 season. Open to all artists, independent curators and arts organizations presenting contemporary work in any medium. The Request for Proposals may be found online. All proposals must be received no later than 5 pm on Thursday, December 17, 2009. Flashpoint Gallery presents cutting-edge contemporary art and provides a springboard for talented artists and curators to enhance their careers. The gallery seeks to inspire creativity and encourage the creation of new work by emerging and under-represented artists and curators. CuDC is seeking inventive, original proposals in any media. This year, for the first time, CuDC is partnering with The Community Foundation of the National Capital Region to make grants to artists participating in the Flashpoint Gallery Program. The Creative Communities Fund (CCF) will provide grants of up to $2500 to artists to support the creation and presentation of new work. DC area artists applying to the Flashpoint Gallery are encouraged to submit grant applications in conjunction with their program applications. Come out this weekend and tour the studios of local artists located in Dupont Circle and Logan Circle. The self guided walking tour is metro accessible. Plan for a unique day in this art mecca and visitor friendly location. Supporting businesses include restaurants and galleries that are located near all the artists studios. Make a day or two of it. You'll be surprised and delighted with the artists and the art. Mid City Artists are a diverse and talented group of nearly 40 professional artists who have come together for the purpose of promoting their art, and the Dupont/Logan neighborhoods they call home. It is an opportunity to integrate their art with the fast growing retail and commercial concerns that are located in this area. This exhibition located in Gallery I features work from artists participating in Open Studio Tour. For over 20 years School 33 Art Center’s Open Studio Tour has brought together professional artists and the general public, giving collectors and art lovers the opportunity to visit studios of visual artists. The Baltimore Office of Promotion & The Arts, Inc. (BOPA) is proud to announce the fifth edition of the Janet & Walter Sondheim Prize. The prize will award a $25,000 fellowship to a visual artist or visual artist collaborators living and working in the Baltimore region. The prize is in conjunction with the annual Artscape juried exhibition and is produced with our partners, The Baltimore Museum of Art (BMA) and the Maryland Institute College of Art (MICA). Approximately six finalists will be selected for the final review for the prize. Their work will be exhibited in the Thalheimer Gallery of The Baltimore Museum of Art. Additionally, an exhibition of the semi-finalists’ work will be shown in the Decker and Meyerhoff galleries of the Maryland Institute College of Art during the Artscape weekend. The fellowship winner will be selected from The Baltimore Museum of Art exhibition after review of the installed art and an interview with each finalist by the jurors. The remaining finalists not selected for the fellowship will each receive a $1,000 honorarium. Artist collaborators if chosen as the winner will receive a single $25,000 prize or $1,000 honorarium that will be equally divided among the members of the group. Janet Sondheim danced with the pioneering Denishawn Dancers a legendary dance troupe founded by Ruth St. Denis and Ted Shawn. Later, she turned to teaching where she spent 15 years at the Children’s Guild working with severely emotionally disturbed children. After retirement, she was a volunteer tutor at Highlandtown Elementary School. She married Walter in 1934, and they were together until her death in 1992. The Jurors will be announced on December 1, 2009. Anne Marchand, Whirl 2009 acrylic and mixed media, 36" x 36"
You can also go to my website and download a pdf of the newletter from my events page at http://annemarchand.com/events.html (You'll see FALL NEWSLETTER in the black area above google groups. Click on the text to download a copy). I hope you enjoy reading about the projects and will come to see some of the work. Please write with any questions or insights you'd like to share. I would love to here from you. Spotlight on Design Series is sponsored by Lafarge, the world leader in construction materials, with additional support from the American Institute of Architects. Saturday, October 24th, 12-4 p.m.
8519 Georgia Ave.. at the corner of Georgia and Ellswoth Dr. Please come and tell your friends about the exhibition. Every mask is unique and beautifully viewed in person. The show is up now and the store is open everyday except Monday. Tuesday, October 27, 7 p.m.
With high-profile clients, including Barack and Michelle Obama, and an award-winning style, designer Michael Smith’s career is soaring. Now set to redecorate the White House, he’ll discuss his favorite projects and creative inspirations at the Corcoran. Crystal City (Arlington, VA) - The Crystal City Business Improvement District (BID) in partnership with Arena Stage is introducing a temporary, outdoor art exhibit that pays homage to the great scientific mind of R. Buckminster Fuller and his creation of the geodesic dome. “Bucky-Art” celebrates Arena Stage’s spring production of R. Buckminster Fuller: THE HISTORY (and Mystery) OF THE UNIVERSE which runs May 28 – July 4, 2010. The exhibition will open April 1, 2010, and will last throughout the summer. To kick off the project, the Crystal City BID has announced a call for artists – whether Bucky fans or proponents of his green principles – and expects to launch the statues on April 1, 2010. Interested artists should visit www.crystalcity.org to learn more and download the formal application. Arena Stage, a nationally recognized non-for-profit theater, has made a temporary home in Crystal City. Its production on renaissance man R. Buckminster Fuller, inventor of the geodesic dome, will explore humanity and its chance to survive on “Spaceship Earth.” The show is an unforgettable journey inside one of the most remarkable minds of the 20th century in a dazzling, virtuoso multimedia performance. A hero of the green movement, Fuller framed many of the great environmental ideas of his time and ours. The play may not only change your life but the life of our planet as well. “Bucky-Art” is part of the Crystal City BID’s ARTFUL program. This new exhibition builds on the success of previous Crystal Art projects which have demonstrated the power that art can add to public spaces. The Crystal City BID is responsible for changing how people see and perceive Crystal City, and art remains a critical means of achieving this goal by adding color, interest and conversation to the streets, sidewalks and public spaces of Crystal City. Check out this talented artist! Washington, DC artist Ben Tolman is one of the 50 finalists in the Smithsonian National Portrait Gallery's Outwin Boochever Portrait Competition 2009. His drawing "Jana" will be up at the museum from October 23, 2009 to August 22, 2010. There will be an opportunity to vote for his piece as the "visitor's favorite" both in person as well as online. Ben is writing a blog as part of the exhibition at http://www.portraitcompetition.si.edu/artist/splash.html. 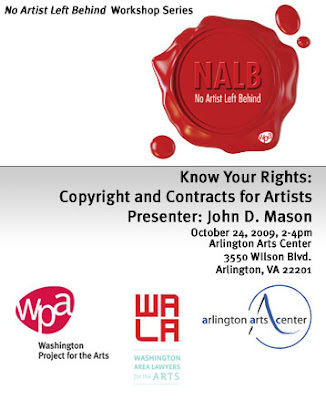 Washington Project for the Arts and Washington Area Lawyers for the Arts (WALA) invite you to a No Artist Left Behind workshop on Copyright and Contract basics at Arlington Art Center. John D. Mason, an attorney at The Intellectual Property Group, PLLC., will share valuable information about contemporary issues in copyright law that artists need to know, followed by a question and answer session. The Dirty Green, a two-man art show by Washington, DC-based artists Kelly Towles and Billy Colbert. The show explores thievery and and how cartoons have chronicled the actions of bad con men, in their endless pursuit to conquer the good. Washington's popular fall walking tour of artists' studios in the U Street, Dupont Circle, Logan Circle and Thomas Circle neighborhoods takes place this year on October 24 and 25 with the addition of three new artists and a host of business supporters. Visitors to the Mid City Artists' (MCA) event meet community artists in their workspaces to see a range of new work, including drawings, sculptures, paintings, prints, photographs and mixed media. MCA hosts the tour twice a year, in the spring and fall. Curator Rachel Sitkin discusses her view of the exhibition's social relevance. Participating artists Alex Lukas and Michelle Hagewood speak to their interest in the manmade landscape. "The Bill & Melinda Gates Foundation has contributed $10 million to the Smithsonian’s National Museum of African American History and Culture, expected to open in late 2015 on the National Mall in Washington. The purpose of the grant is to support the capital campaign of the new museum, which is raising funds for the design and construction of its building." A group of Chicago artists discuss creative ways of making a full-time living beyond the traditional gallery system. The critic and curator speaks to The Art Newspaper"
Robert Storr, US critic, curator and dean of the Yale School of Art, is visiting Frieze Art Fair for the first time, to take part in “Scenes from a Marriage: Have Art and Theory Drifted Apart?”, a panel discussion today at 12pm with artist Barbara Bloom and philosophy professor Simon Critchley. He spoke to The Art Newspaper about the role of art theory, and what advice he is giving to his students in today’s artistic climate. Design Week DC is upon us! This is a unique opportunity for Washington DC designers-- just take a look at the action-packed agenda. Your best bet: an education lecture series on Saturday, October 24, made up of 30-minute back-to-back presentations at Cady's Alley in Georgetown (these presentations are usually given to architectural firms, but they are free for your enjoyment during Design Week). Free food and drinks will be offered at the events. 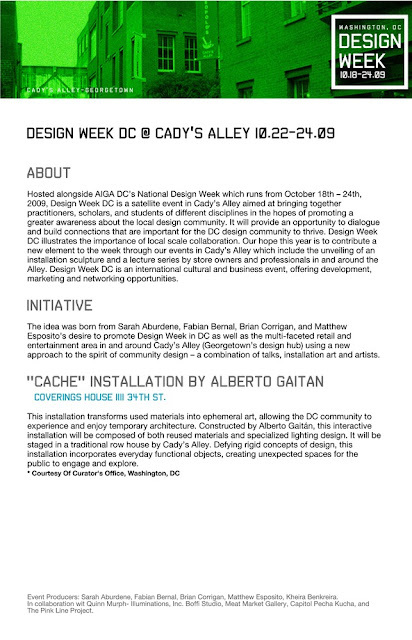 For more info, visit Design Week DC. Georgetown's gallery walk, coined the “Georgetown Gallery Gaze” will be taking place every 3rd FRIDAY of the month. The participating gallery owners will be opening their doors with extended hours, from 6-9 pm, welcoming people with art, music, libations, and nibbles. 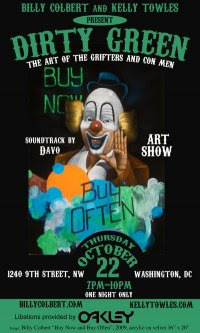 Fine art , wearable art to adorn, and artful patrons will be there. All are invited to explore the festivities along the cobble-stoned streets of Georgetown, enjoying, appreciating, and socializing with the different local and visiting artists that each gallery spotlights. Closer to Canal Square, one will hear a soft hum of an acoustic guitar. Through the small passageway from M St., you'll find yourself surrounded by a handful of art galleries as well as musicians Mike Meier on acoustic guitar with Linda Bird on flute. There will be musical guest artist Dave Freund and sponored by Barefoot Winery. 1) a man/ woman a-la-carte naked sushi 's that can only be retrieved by your bite ;). If you drop the piece, you will have to down a cup of sake and pay double for the sushi! Langley Bowers' ('04) documentary "Eastern Market: The Rebuilding" is an 18 minute video which tells the story of the 2007 Eastern Market fire and the inspirational rebuilding process that followed. Interviewees and contributors include a charismatic array of market vendors, DC public officials (Adrian Fenty, Dan Tangherlini, Tommy Wells, Eleanor Holms Norton), non-profit representatives, and community members. The video was sponsored by the Capitol Hill Community Foundation (CHCF) and the Ruth Ann Overbeck Oral History Project. DVDs will be available at the premiere, and the video will be made available online through the CHCF website. To RSVP or request additional information, call (301) 955-7937. The exhibition is free and open to the public 9 am – 9 pm. 8"h x 4"w x 10.5"d.
An intriguing exhibition of metal and fiber graces Gallery Neptune this fall with the outstanding artwork of Joyce Zipperer and Rania Hassan. Both artists excel in their mediums and both use their art to define communities that are personal to each of them. Joyce Zipperer has been producing art in the Washington, DC area for more than twenty years and fashion has played a major role which informs her work. Her history of women’s undergarments has been expressed through hand crocheted metal wire or sheet metal sculptures and covers everything from corsets to bloomers to brassieres and “Days of the Week” underwear. Woman’s accessories have also made their way into Zipperer’s portfolio. In 2007 she was featured in Neptune’s “Brand New Talk Collection” with oversized jewelry, hats, gloves and high heeled shoes in metal, fabric and wood. In the gallery’s current exhibit, she returns with her focus strictly on high heels: “Throughout history, women have been influenced by trends in fashion, often discounting comfort and health issues. Some of my work addresses issues concerning bound torsos and cramped feet in shoes of exaggerated styles.” Acknowledging its allure, Zipperer agrees that fashion design sometimes weakens our sensibilities; a difficult thing to reckon with when trendy is hip and fun. In 2003 Joyce Zipperer was inducted into the National Association of Women Artists in New York, for sculpture. DCAC's resident collective considers the artistic process as a mode of inquiry, a domain characterized by sustained research and vigorous experimentation, yet focused less on the production of definitive answers than on the discovery and negotiation of contradictory truths. While the exhibition demonstrates the diverse concerns and creative tactics of the nine Sparkplug members, it also reflects the purposeful development of Sparkplug as a collective over the group’s first two years of working together. Positing art as an ideal vehicle for navigating seemingly irreconcilable ideas and inspirations, and raising questions about the nature of new knowledge and the Artist’s Work, FINDINGS brings themes cultivated during collective meetings and studio visits into the gallery space. In this way, the audience is invited to engage in active conversation with individual artists, and with Sparkplug as an organic and multifarious whole. Crowned by the vibrantly-colored, 3 story mural titled "Community" by local artist Anne Marchand, the Westminster Playground is urban oasis that brings neighbors together and helps foster the mural's namesake, community. The playground exhibition is free and open to everyone, is wheelchair accessible, and only two blocks from the U Street Metro station (10 Street exit). Since this exhibition is weather sensitive, please check Nikolas’s website, http://www.nikolasschiller.com/blog/ before noon o n October 18th if the weather looks bad. We hope to see you! Chuck Baxter creates found object art from materials tossed in DC’ s gutters and alleys. For the past decade Chuck has built a reputation, in his own mind, as the D.C. area’s foremost collector of gutter gifts. He’s a U.S. Department of Veterans Affairs bureaucrat, a DC artist, and minimal director of his own life. Few of Chuck’s pieces hang in DC business and government offices, and in the homes of art collectors and friends around the world. “I have always felt the pull of throw-aways, and sought to invoke the world of junk as the natural medium for the urban artist.”20His fascination with the flotsam of city life and the details of trash, such as broken glass, smashed plastic, crumpled paper, and lost toys, is the starting point for most of his pieces. The=2 0underlying compositional theme of his work draw from the common shapes and forms found in the gutter. Chuck currently resides in the Shaw where he simmers in his own private studio. George Smith-Shomari is an artist, professor and artistic consultant who's artwork focuses on the Universal African Diaspora. A native of Brooklyn, New York, Professor Smith received his Bachelor of Fine Arts degree from Howard University and his Master's with a specialization in printmaking and art education from Pratt Institute. In addition to teaching at the University of the District of Columbia, George Smith has taught in the DC Public School System and several museums in New York City. The artistic works of George H. Smith, have appeared in numerous one man and group exhibitions in museums, galleries, schools, colleges and universities throughout the United States and abroad. Nikolas Schiller is a digital artist who maps the territory between art & science. After studying geography & computer science at the George Washington University, in 2004 he began developing abstract geographic designs based on kaleidoscopic aerial photography and satellite imagery. In the years since, he has mapped nearly every major city in the United States, including each ward of Washington, DC. His unique maps have been featured on book covers, album covers, and are in the permanent m ap collections of the Library of Congress, British Library, New York Public Library,=2 0and the University of California, Santa Barbara. 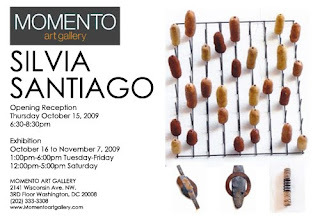 He is the two-time recipient of the DC Commission on the Arts and Humanities Young Artist Program Grant (2006 & 2008) and most recently had his artwork on display at Artomatic 2009 in Washington, DC and "Photocartopgrahies: the Tattered Fragments of the Map" in Los Angeles. The Painter's Secret Geometry by Maggie Siner. Registration is required. Please contact Washington Studio School for more information and to register for the lecture. Born in Providence, Rhode Island, Siner began her studies at the Art Students League of New York in 1968, then graduated from Boston University (BFA, 1973) and American University (MFA, 1976) where she studied with Robert D'Arista. She subsequently lived for extended periods in France and China. Her work has been exhibited in galleries and museums for over 30 years and is in hundreds of private collections around the world. She has been on the faculty of l'Institute d'Universités Américaines and the Lacoste School of Art in France (Cleveland Institute of Art), a visiting professor at Xiamen University in China, artist in residence at the Savannah College of Art and Design, Dean of Faculty at the Washington Studio School and teaches master classes around the country. She is a frequent guest artist and public speaker known for her lectures on painting. She has taught at the Washington Studio School since 1983 and is represented by several galleries in the US. 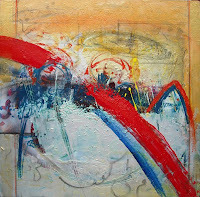 To learn more about Maggie Siner and to see examples of her work visit www.maggiesiner.com. 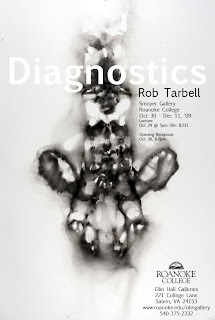 Saturday, October 17, from 5 - 7pm with a Gallery talk at 6pm. As the sun sets and the evening light illuminates the gallery, visit GRACE for a unique opportunity to wander amongst the flowers of the elemental garden. Rebecca Kamen’s sculpture, created to represent the first eighty-three elements of the periodic table, explores the territory where science and art converge. The evening is highlighted by an artist talk at 6pm. In attendance will be soundscape composer Susan Alexjander, collaborating architect Alick Dearie, and catalog essayist James Mahoney. Catalogs will be available for signing and purchase. Philippa P. B. Hughes talks about The Red Bull Art of Can, a touring exhibition now in DC. WASHINGTON - The 2009 Red Bull Art of Can exhibition will be held in Washington D.C. at Union Station from October 8 – 19, 2009. The exhibition will feature original pieces of artwork that have been created or inspired by Red Bull cans. Exhibit judge Philippa Hughes and artist Leanne Spencer joined FOX 5 Morning News with more on the D.C. exhibit.